We are delighted to announce that our 92nd Tournament will begin on the 29th July 2019. The facilities at Culford are excellent, and the Tournament enjoys the use of 4 indoor and 7 outdoor hard courts. Run totally by volunteers who give up their time willingly to provide competitive tennis for all age groups. We hope everyone has great fun in an unintimidating environment and leaves fulfilled and inspired to compete more. The Bury and West Suffolk Tennis Tournament started back in 1927 as a grass court tournament at the Victory Ground for seniors and juniors. 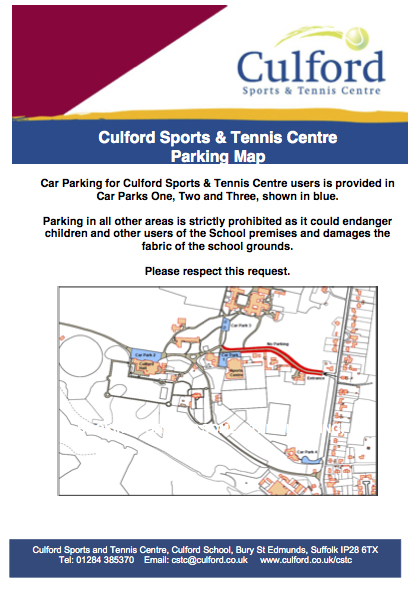 It moved to Culford School in 2012 with its 4 indoor and 7 outdoor courts, 2 of which were added last year. We have also added Mens and Ladies events to the tournament. Culford is now a Tennis Centre of Excellence producing a steady stream of national standard players. We aim to provide good competition and enjoyment for all in a “Fair Play” environment. We are progressive, each year building on the success of the previous tournament, whether improving the players’ experience or introducing a new event. Championship standard venue with superb indoor and outdoor tennis facilities with 11 courts. Don’t miss out; enter today! Culford is 1 hour 30 minutes from London (M11/A11/A14), 40 minutes from Cambridge (A14) and Ipswich (A14), and under 1 hour from Norwich (A11/B1106). From the A14 (London/ Cambridge/Ipswich) Exit the A14 at Junction 42 (Bury St Edmunds West) and at the roundabout take the exit signposted Brandon B1106 (RAF Honington). Continue along Tut Hill past Bury St Edmunds Golf Club on the right until the double mini-roundabout. Go straight over into Fornham All Saints village, past the Church and the Suffolk Golf Club, and continue until the roundabout. Take the first exit signposted Culford and Brandon B1106. Continue along this road until you reach Culford village. The entrance to the School will be seen on the left-hand side. From Norwich on the A11 travelling south on the A11 from Norwich, take the B1106 just south of Thetford signposted Bury St Edmunds. Culford is in 6 miles. Culford School is in the centre of Culford village. Spam prevention : Please type these characters as you see them : - To use CAPTCHA, you need Really Simple CAPTCHA plugin installed.